As we continue the conversation about having a clear ‘why’ for what we do, I think it’s good to have some real life examples . . .
No one ever said, ‘wow. Gandhi is all over the map. 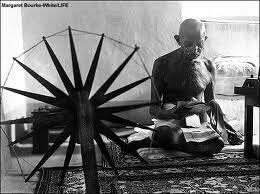 He sure doesn’t walk his talk.’ Gandhi strove his whole life to make sure that what he did and how he did it matched the deeper ‘why’ behind them. 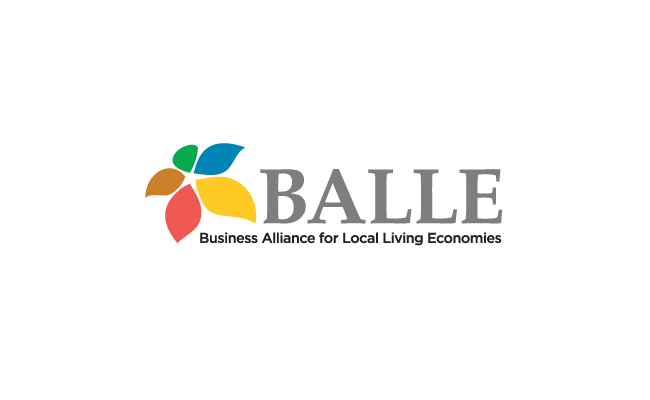 Another example – I think of the work of the Business Alliance for Local Living Economies to help us transition from the ‘suicide economy’ we’re all a part of to ‘local living economies’. That’s an extremely clearly articulated ‘why’. 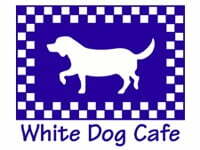 Judy Wicks started the White Dog Café in Philadelphia. 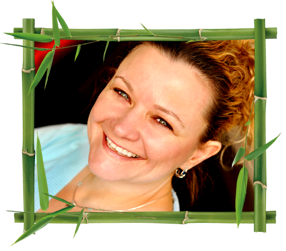 Early on in her career she began to source her meats from cruelty free, local farms and get all of her coffee fair trade via contracts she negotiated directly with the communities she visited. She could easily, and justifiably have said, ‘I’m the most ethical restaurant in Philly.’ But, instead, she thought, ‘if I really care about these animals and I really care about these communities down south . . . then I’d want all restaurants being fair trade.’ So, she went to her competitors and urged them to become more ethical and sustainable. She provided loans to some of the local farmers who were struggling. It wasn’t just about her and her business. It was about something bigger. Chris Chopik is a green realtor in Toronto. And, sure, he could try to brand himself as Toronto’s greenest realtor. But instead he speaks at real estate conferences about how they can (and should) all become green realtors. Instead of hoarding it, he’s sharing it. He wants to see the whole industry go green. Of course, because of these efforts, he’s seen as a leader and has a strong reputation as a green realtor. A woman named Linda Marie who I met at the Institute for Traditional Medicine in Toronto was sharing with me about her work with people around death and dying. As she shared about her work, it became clear that what it was really about for her. I asked her to share it. She said that her work was about ‘grief, suffering, and hopelessness’. This didn’t sound terribly uplifting. So, I probed deeper. ‘What,’ I asked her. ‘Is on the other side of those things?’ Deep in her bones she felt that grief, suffering, and hopelessness could be a doorway into growth, expansion, and compassion. That we can use our relationship to dying as a door for transformation. Beautiful. In his brilliant book, ‘Start With Why‘ – Simon Sinek shares a few mainstream examples . . .
SOUTHWEST AIRLINES: In the early 1970s, only 15 percent of the traveling population travelled by air. At that rate, the market was small enough to scare off most would be competitors to the big airlines. But Southwest wasn’t interested in competing against everyone else for 15 percent of the traveling population. Southwest cared about the other 85 percent. Back then, if you asked Southwest whom their competition was, they would have told you, “We compete against the car and the bus.” But what they meant was, “we’re the champion for the common man.” That was WHY they started the airline. That was their cause, their purpose, their reason for existing. HOW they went about building their company was not a strategy developed by a high-priced management consultancy. It wasn’t a collection of best practices that they saw other companies doing. Their guiding principles and values stemmed directly from their WHY and were more common sense than anything else. In the 1970s air travel was expensive, and if southwest was going to be the champion for the common man, they had to be cheap. It was an imperative. And in a day and age when air travel was elitist, back then people wore ties on planes – as the champion for the common an, Southwest had to be fun. It was an imperative. In a time when air travel was complicated, with different prices depending on when you booked, Southwest had to be simple. If they were to be accessible to the other 85 percent, then simplicity was an imperative. At the time, Southwest had to price categories: nights/weekends and daytime. That was it. That’s HOW they did it. That’s how they were to champion the cause of the common man. The result of their actions was made tangible in the things they said and did – their product, the people they hired, their culture and their marketing. “You are now free to move about the country” they said in their advertising. That’s much more than a tagline. That’s a cause. And it’s a cause looking for followers. Those who could relate to Southwest, those who saw themselves as average Joes, now had an alternative to the big airlines. Just because Southwest is cheap doesn’t mean it only appeals to those with less money. Cheap is just one of the things Southwest does that helps us understand what they believe. It is a false assumption that differentiation happens in HOW and WHAT you do. Simply offering a high-quality product with more features or better service or a better price does not create difference. Doing so guarantees no success. Differentiation happens in WHY and HOW you do it. Southwest isn’t the best airline in the world. Nor are they always the cheapest. They have fewer routes than many of their competition and don’t even fly outside the continental United States. WHAT they do is not always significantly better. But WHY they do it is crystal clear and everything they do proves it. There are many ways to motivate people to do things, but loyalty comes from the ability to inspire people. Only when the WHY is clear and when people believe what you believe can a true loyal relationship develop. HARLEY DAVIDSON: There are people who walk around with Harley Davidson tattoos on their body. That’s insane. They’ve tattooed a corporate logo on their skin. Some of them don’t even own the product. Why would a rational person tattoo a corporate logo on their body? The reason is simple. After years of Harley being crystal clear about what they believe, after years of being disciplined about a set of values and guiding principles and after years of being doggedly consistent about everything they say and do, their logo has become a symbol. It no longer simply identifies a company and it’s products, it identifies a belief. The logo embodies an entire value set – their own. The symbol is no longer about Harley, it’s about them. Let’s look at the Apple example and rewrite the example in the order Apple actually communicates. This time, the example starts with WHY. It’s a completely different message. It actually feels different from the first one. We’re much more eager to buy a computer from Apple after reading the second version. And all I did was reverse the order of the information. It’s worth repeating: people don’t buy WHAT you do, they buy WHY you do it. When communicating from the inside out, however, the WHY is offered as the reason to buy and the WHATs serve as the tangible proof of that belief. I’m not so foolhardy as to propose that Apple’s products don’t matter. Of course they do. But it’s the reason they matter that is contrary to conventional wisdom. Their products, unto themselves, are not the reason Apple is perceived as superior; their products, WHAT apple makes, serve as the tangible proof of what they believe. It is that clear correlation between WHAT they do and WHY they do it that makes Apple stand out. This is the reason we perceive apple as being authentic. Everything they do works to demonstrate their WHY, to challenge the status quo. Regardless of the products they make or the industry in which they operate, it is always clear that Apple “thinks different”. Apple did not invent the mp3, nor did they invent the technology that became the iPod, yet they are credited with transforming the music industry with it. The multigigabyte portable hard drive music player was actually invented by Creative Technology Ltd, a Singapore based technology company that rose to prominence by making the Sound Blaster audio technology that enables home P.C.’s to have sound. In fact Apple didn’t introduce the iPod until 22 months after Creative’s entry into the market. This detail alone calls into question the assumption of a first mover’s advantage. Given their history in digital sound, Creative was more qualified than Apple to introduce a digital music product. The problem was they advertised their product as a 5gb mp3 player. It is exactly the same message as Apple’s 1000 songs in your pocket. The difference is Creative told us WHAT their product was and Apple told us WHY we needed it. Dell came out with PDAs in 2002 and mp3 players in 2003, but lasted only a few years in each market. Dell makes good quality products and is fully qualified to produce these other technologies. The problem was they had defined themselves by WHAT they did, they made computers, and it simply didn’t make sense to use to buy a PDA or mp3 player from them. How many people do you think would stand on line for six hours to buy a new cell phone from Dell, as they did with the release of Apple’s iPhone? People couldn’t see Dell as anything more than a computer company. It didn’t make sense. Poor sales quickly ended Dell’s desire to enter the small electronic goods market. Instead, they opted to focus on their “core business.” Unless, Dell, like so many others, can rediscover their founding purpose, cause or belief and start with WHY in all they say and do, all they will ever do is sell computers. They will be stuck in their “core business”. Apple, unlike its competitors, has defined itself by WHY it does things, not WHAT it does. It is not a computer company, but a company that challenges the status quo and offers individuals simpler alternatives. Apple even changed its legal name in 2007 from Apple Computer Inc., to Apple Inc., to reflect the fact that they were more than just a computer company. Practically speaking, it doesn’t really matter what a company’s legal name is. For Apple, however, having the word “computer” in their name didn’t limit WHAT they could do. It limited how they thought of themselves. The change wasn’t so practical. It was philosophical. Everything that comes out of the base of the megaphone serves as a way for an organization to articulate what it believes. What a company says and does are means by which the company speaks. I recently met a woman who offers business mentorship to women entrepreneurs. And, yes, there’s the technical side of it – the information she passes on and particular issues she helps them with but, for her, it’s about independence, the beauty of intergenerational support from woman to woman, the shift from cooperation not competition, and women having real choices in their lives instead of feeling trapped and living in the fear of being dependent on a spouse. Charlotte Lammerhirt is a mortgage broker in Calgary for her, at it’s heart, her work is about helping homeowners enjoy the kind of freedom to have the kind of lifestyle they want. Graham Stones is a wonderful fellow who lives in England. His ‘boat’ is massage therapy and yoga. But there are lots of folks in London who do that. One day we were chatting and I asked him, ‘why do you do this? What is this about for you?’ and he said, ‘You know, London can be a very depressing, heavy and negative place and I kind of want to fight back against that sometimes.’ As our conversation evolved, it became clear that optimism was at the heart of his work. Years ago, I worked with Sheryl Watson (pictured here) who did breast massage. It was really beneficial for women in maintaining breast health in the face of the increase of breast cancer. I looked at her brochure one day and . . . it was so dry. Technical. And I felt confused. Here was this earthy, vibrant woman with this clinical brochure. I asked her about it. She admitted that she was scared of a brochure about breast massage seeming creepy or weird. Which I can understand – but I think she might have thrown the baby out with the bathwater. On the other hand, if it’s really about women’s empowerment then she has a much wider range of options available to her in what she could put in her blog: TED Talks by powerful women, fundraising events about women’s empowerment, women’s self defense, reviews on books, movies, recipes etc. Having a clear ‘why’ frees you. And, as you can see from her website – that ‘why’ that was so close to her heart is flowering in beautiful ways. You can be known for the boat you use. But you can also be known for what they journey is about. A few years ago, I went to a marketing workshop and got put on the hotseat and grilled on why I do what I do. And, after a few minutes of struggling, it became clear that the pay what you can isn’t just something I do, it’s something that matters to me. That, at its heart, it’s about accessibility and justice for me. Accessibility of marketing info is a bigger cause than pay what you can. Pay what you can is a tactic, an expression of my desire for justice and accessibility. Marissa Heisel (pictured right) is one of the only people in Canada trained as both a chiropractor and a midwife. When we spoke she said to me, “every woman deserves the right to have a healthy, beautiful, joyous pregnancy and parenting experience.” That sounds like a cause to me. Who could argue with that? Which is part of the point – when you really land on a clear ‘why’ it’s often, at its heart – inarguable. Your point of view is, by definition debatable – the larger cause is much less so. Again, can you nestle your work into the larger story? 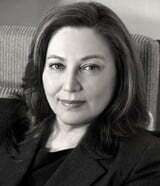 Tanya Fraser is a nutritionist in Toronto with a focus on heart issues in women. So, her niche is relatively clear. She’s got a clear boat (nutrition) and a clear journey (heart health) she takes people on. So, two of the four elements of the platform are there. I offered to her that she might want to explore using the heart metaphorically too. “It seems,” I said. “That you help women to have strong hearts. But why does that matter? So what? What does it mean to be a strong hearted woman? Are there emotional heart issues? The heart is so linked with qualities of love, compassion and empathy.” She’d never considered a deeper and wider story on that before. To me, it feels different to say, “I imagine a world full of strong hearted women. I think that women play such a vital role in the healing of the world. And I work with them to help keep their hearts strong.” That doesn’t mean she needs to branch into emotional work herself – but it opens the doors to all sorts of other partnerships that might not have been available before. Saraswatishanti is a yoga teacher in Toronto who started out as angry young straight edge punk. But yoga got her into compassion. It opened her heart. Yoga is just a boat. And for each teacher, yoga will be, at its heart, about something else. For some it will be optimism, for others compassion and for others community. 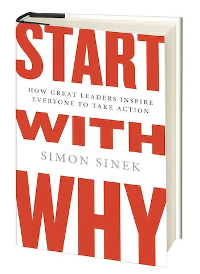 And, in his book, Simon Sinek invites us to start with why. Imagine the difference between any of the people I’ve mentioned simply talking about their boat vs. sharing their personal ‘why’. Isn’t it more inspiring to hear the deeper why? Doesn’t it give the boat more context when we can see the whole sky? 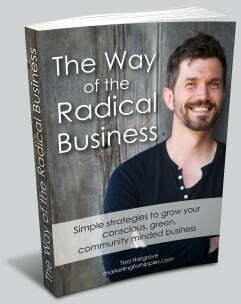 What is the ‘why’ behind your business?